Lower Tropospheric Temperature for 2018 is the sixth warmest in recent history and one of the warmest La Niña years since 1979. Date from satellites shows that for the lower troposphere, 2018 was the sixth warmest recorded since satellite observations began in 1979. 2016 was the warmest ever recorded, followed by 2017. Both of the most recent northern hemisphere winters (2016-2017 and 2017-2018) were characterized by weak La Niña conditions in the tropical Pacific, which typically cause relatively cool global temperatures during the following calendar year. 2017 and 2018 were the warmest La Niña years in recent history. Fig. 1. Annual mean, global (80S to 80N) temperature anomalies (difference from the long-term 1980-2009 average) for the lower troposphere (TLT). The map below shows the annual anomalies for 2018. Almost the entire globe is warmer than the 1980-1999 baseline, with many regions in the northern hemisphere more than 1 K warmer than the baseline. 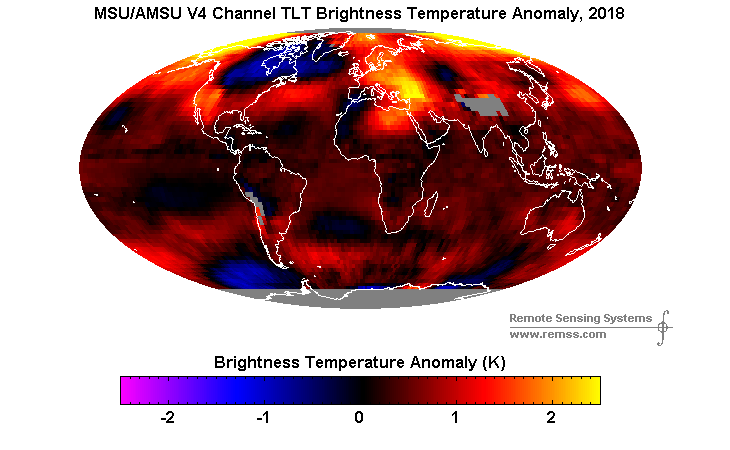 Mears, C. A., and F. J. Wentz (2017), A Satellite-Derived Lower-Tropospheric Atmospheric Temperature Dataset Using an Optimized Adjustment for Diurnal Effects, Journal of Climate, 30(19), 7695-7718.